A very enjoyable movie about a criminal on the run from the law who teaches and relates well to the kid he has kidnapped. 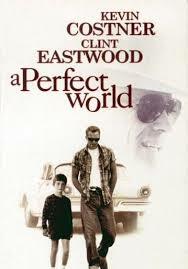 A Perfect world is all about Kevin Costner. It might costar and be directed by Clint Eastwood, and it’s probably one of Eastwood’s better films as a director. But on the screen, watching the performance and getting sold on it, it is all Costner. That’s because he is not only the star, but in many ways the whole movie. Kind of like cast away, I am legend, or any of those movies which is about a man on his own, either lost or else the last person left on earth. The difference is that Costner is not alone, on the run in this movie. He’s got a little boy to bounce conversations off of. 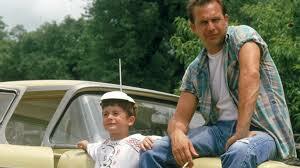 That little boy is Phillip, and he’s a Jehovah’s witness whom Costner’s character, Butch, kidnaps early on. Butch and his cellmate break out of prison to start the movie and then run through the streets of a nearby town looking for a car to steal. They break into the boy’s house and grab the boy as a hostage to help them escape. After the cellmate crosses the line with the boy and Butch becomes aware of it, he takes the cellmate out of the equation. Butch never liked the guy to begin with and made no qualms about hiding that fact. His conversation with the cellmate about the difference between a threat and a fact is a lot of fun, as he demonstrates the difference by breaking the cellmate’s nose. But once Phillip and the cellmate leave the car, the cellmate has gone too far. It’s like the car is symbolic of safety and where they should remain. No sooner do they leave it, and then one of them is killed. The cellmate broke the rules and while Butch doesn’t know the details of what exactly the cellmate did, he doesn’t feel that he needs to. Soon it is just Butch and the boy riding around together. And that’s pretty much the way it stays for the rest of the picture. Butch asks the boy questions about his life, such as has he ever been on a roller coaster or eaten cotton candy before and what are some things the boy would like to do. It seems that since Butch has no real agenda for himself, his agenda then becomes about the boy, to help set things right for him to get the fun things that kids are supposed to be allowed to do. This becomes especially obvious when the boy steals a Casper the friendly ghost outfit from a clothing store and then Butch takes him around trick or treating. Early on in the movie, before Butch ever arrived on the scene, children came to Phillip’s house to trick or treat. Phillip’s mom told them they didn’t take part in Halloween and the kids ended up throwing water balloons at the windows saying, “here’s a trick.” Phillip watched from the window as water balloons smashed and exploded right in front of him. Well, Butch is there to set things right. He puts Phillip on the other side of the situation, taking the boy trick or treating during the daytime of the next day, when it is no longer Halloween. Butch stands beside the boy as he rings the bell and shows the people his gun to make sure they give Phillip a little something to put in his bag. Butch also changes the boy’s name to buzz. He says he’s doing it so that they have aliases or bandit code names, but notice that Butch never changes his name. Only the boy’s. And notice how similar the name buzz is to Butch. By changing the boy’s name to a name so close to his, Butch is in a sense adopting the boy and acting like he is the boy’s father, the way a new father might name his son after him and call him junior. The Clint Eastwood character does have a pretty big part in the movie, out on the hunt, pursuing Butch. The only problem is, even though he is given a good amount of screen time, Eastwood doesn’t really make the character any different than any of his other characters. He’s a mean, cranky old man. A tough guy, who might be smart, but has no sense of how to crack a smile or laugh. Not only is it the same kind of part that Eastwood has played over and over again in the last twenty years (let’s say 1990-2010), but it’s also the kind of role that another actor could have played. Eastwood doesn’t really make it his own, or do anything unique. His performance is not bad at all; it’s just nothing special. Eastwood’s character travels around in a mobile home silver trailer attached to and pulled by a small truck. It’s a vehicle that is meant for the governor to ride around in during his campaign, only Eastwood sees it and decides to take it, bullying the driver around into giving it to him. He rides in this thing with some of his own people as well as a criminal psychologist (Laura Dern) and a man sent from the FBI who wears sunglasses and seems like the only thing he’s interested in is killing Butch. One of the best scenes in the movie has Laura Dern pretend that she is Butch for the purpose of understanding his motivations, and acting out his part to the men in the trailer, answering questions the way Butch might answer them. Dern is pretty good in her role. She and Eastwood are the ones who have the most interaction in the trailer, but their conversations still aren’t deep enough. They do a nice job talking about Eastwood’s history and back-story but don’t talk enough about Butch and where he might be going. A perfect world is an enjoyable movie because of the Kevin Costner journey with this boy. He teaches the boy well, and by the end of the movie, the boy shows that he has learned. The tension builds as the film goes on and so do the things that Butch and Phillip do. When they find themselves staying over at the home of a black couple, we have no idea what the scene will end up becoming. Butch is on a mission here to help the boy out and help him to find his own personality, his own likes and dislikes, and to not be afraid of things anymore. The open field beginning and ending might be the most memorable images in this film, but the heart of the movie is in the way that Butch and the boy relate to each other. It’s a very powerful and well-made movie.